Livingston Park Apartments (the “Property”), located on a single 9.14 acre parcel of land in the Shaker Square neighborhood of Cleveland, Ohio, consists of 10 three-story buildings each containing 18 units, and 1 three-story building containing the 15 deluxe 2br/2ba units plus the management office. The Property benefited from some partial rehabilitation, in 2004/2005, funded through a combination of a HUD-insured first mortgage and Low Income Housing Tax Credit Equity. The property rehabilitation effort, while not inexpensive, was, in hindsight, inadequate in addressing the needed system upgrades and marketability of the apartment units. It did nothing to (i) make the property and the rental units appealing to individuals and families with moderate incomes that, because of Cleveland’s soft rental market, had other housing options, nor did it (ii) make the operations of the property cost effective. In 2009, The Finch Group (“TFG”) was selected by the City of Cleveland to be the designated redeveloper of Livingston Park. TFG took over ownership and management of Livingston Park in March, 2010, at a HUD foreclosure. Following the acquisition of the Property, TFG diligently created a development plan that would (i) provide quality housing to its residents of limited financial means and (ii) provide a real opportunity to invest in its citizen’s social capital. One example of this is that the children of Livingston Park will have exceptional educational opportunities as they are zoned for the Shaker Heights school system. Shaker Heights is viewed by many as the preeminent suburb of Cleveland and has a very “highly rated” school system. The money available from the debt and equity of the earlier transaction went to the cost of the property acquisition, demolition of a number of buildings, the construction of one new building containing 15 two-bedroom units, “rewiring” the entire property, and the implementation of all new kitchens. The “hard cost” construction budget of TFG’s renovation was $7.2M including a 5% contingency. This rehab would involve replacement of the 40 year old roofs, the antiquated (and highly inefficient) heating and hot water systems, the “single pane” windows, the deplorable bathrooms, much needed enhancement of security measures and apartment entrances in addition to other green amenities. Security items (fencing, cameras/monitoring system, lighting, doors, electronic keying, etc.). Additionally , TFG would lower resident housing costs by installing free Wi-Fi access for all residents and upgrade the landscaping design to increase Livingston’s curb appeal. TFG put together a mix of funding that generated $12,000,000 for a complete renovation and rejuvenation of the property. 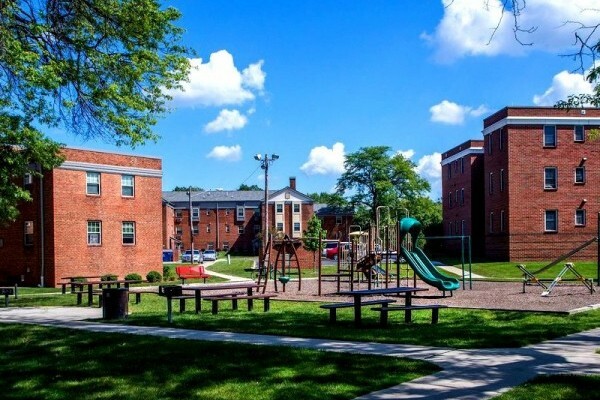 On August 24, 2011, the 195 unit mixed income Livingston Park, located at the border of Shaker Heights, received its final construction completion certificate, less than 14 months after construction commenced. At final completion, Livingston Park was 77% physically occupied and 81% rented. The $5,900,000 non-recourse, first mortgage, the only “must pay” debt on the property is fixed at 3.07%, plus 0.45% for MIP, fully amortizing over 40 years through June 1, 2054. The remaining $3,830,000 of soft debt is a result of structuring “Neighborhood Stabilization Program 1” (“NSP-1”) Grant funds (part of the Federal Government’s “Stimulus” package) into a non-recourse “cash flow” debt. One of the certainties in redevelopment of distressed affordable housing is that very little can be achieved without the support of the local, state and federal elected officials. The City of Cleveland wholeheartedly supported TFG from the beginning. That support acted as a catalyst for other elected officials to provide their support as the redevelopment plan took shape.